Over the holiday break, news broke claiming that Apple was intentionally reducing the performance of older iPhones — specifically the iPhone 6, iPhone 6s, and iPhone SE — in an effort to avoid unexpected shutdowns. Speculation ran rampant and many users took to Twitter to express their anger at Apple for this slowdown, with conspiracy theorists suggesting that it was all aimed at getting people to upgrade sooner. Even if reducing performance was a reasonable way to reduce the likelihood of unexpected shutdowns, people felt that Apple should have communicated better about how that fix had been achieved and given users more information in iOS about what was happening. Apple then went on to explain how lithium-ion batteries age, noting that batteries lose their ability to hold a charge over time and with the number of times a battery has been charged. Plus, other factors, such as extreme heat, can cause a battery to age faster. The problem is that an aging battery doesn’t just run for less time, it’s also less capable of supporting peak energy loads. When that happens while the battery is already low — 30 or 40 percent — the iPhone can just shut down. To address the problem, Apple changed how iOS manages performance, basically trying to even out behaviors that result in requests for peak power. We experienced this problem on both an iPhone 6, which I used for two years before handing it down to Tristan, and an iPhone 6s, which Tonya is still using today. The battery on Tristan’s iPhone 6 is nearly dead — he insisted on nursing it along until he could get my iPhone 7 rather than replace the battery. And while Tonya’s iPhone 6s, which is a year younger, still works, it has long suffered from the unexpected shutdowns. Despite what Apple said, iOS 10.2.1 didn’t eliminate the shutdowns for her — she doesn’t run it low enough that it was worth going without while the battery was replaced (we have no Apple stores within easy driving distance). If nothing else, that would explain why Apple was relatively quiet about the problem before; Apple’s engineers thought they had more or less taken care of it already, and were taken by surprise as iOS throttled performance more and more to prevent shutdowns. Through December 2018, Apple is reducing the price of out-of-warranty battery replacements. Initially, the company said that the lower prices would go into effect later in January, but Apple has already started offering replacements at the $29 price via Apple Stores and Apple Authorized Service Providers. You can also send your iPhone in for a new battery for $29 plus tax and $6.95 shipping. A forthcoming iOS update promises to give users more visibility into the health of their iPhone’s battery. We’d like to see iOS act more like macOS does on laptops, where it puts a “Service Battery” message in the menu bar’s battery menu. Apple will continue to improve how iOS manages performance to reduce the likelihood of unexpected shutdowns as batteries age. To get your battery replaced, visit the Contact Apple Support page, click See Your Products, and sign in with your Apple ID. Select your iPhone and then click Battery, Power, and Charging, then click Battery Replacement, and finally either Bring in for Repair or Send in for Repair. If you’re bringing your iPhone in for a battery replacement, you’ll want to schedule an appointment to avoid waiting. MacRumors is reporting that Apple will accept an iPhone 6 or later for battery replacement regardless of whether the battery has failed the official diagnostic test, and Apple was happy to send me a box for our iPhone 6 without any questions. However, some users have said that Apple was sticking to the requirement that a battery must retain less than 80 percent of its original capacity to be replaced. It’s possible that’s just a miscommunication between Apple Corporate and individual stores. 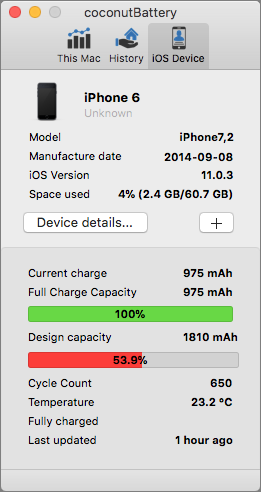 You can use the free coconutBattery app for the Mac to view your iPhone’s battery health. Of course, this situation shows why it would be nice if you could swap batteries on your own. Alas, that ship has sailed for both Apple and nearly all other smartphone manufacturers. FYI, customers who've already had their battery replaced for $79 can get a (partial) refund from Apple, but as the rep explained to me only if you've had it done after Dec 14. Adam, you suggest Coconut Battery which I guess is fine, but it requires a Mac. You can also do this right on the iPhone itself. I got a little free app called Battery Life that gives me the battery health figure directly on the iPhone. Good to know — I see several apps that claim to do this, but I haven't tried any of them. I'm no fan of "free" apps, but in this case it does display the battery data and (non-obtrusive) banner ads. No shenanigans as far as I can tell. Can you post a link to the one you've used, since there are several with roughly the same name? Sorry, should have done that right in the first post. I'm assuming the iPod Touch is also affected? Anyone know if this drop in replacement cost also applies to them? Not surprisingly, battery supply may be constrained for a while.